It’s probably happened to you at least once; you have made all the effort to get to the airport/train station early, only to find out that the next stage of your journey has been delayed. 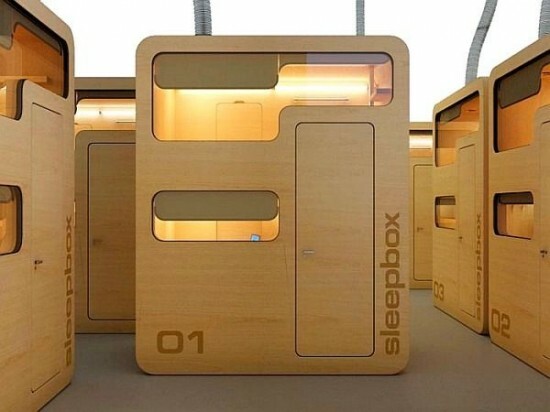 Instead of digging deep and paying for a well-known and expensive hotel or picking an uncomfortable airport or station seat, you could use a Sleepbox, a mini hotel room starting to be rolled out by Russian architects Arch Group, that could change the way people feel about an overnight stay, should they be faced with the prospect. 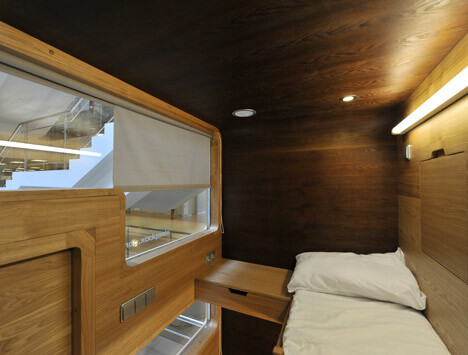 Inside the Sleepbox are LED reading lamps as well as sockets for charging laptops and mobile phones. The pod itself is crafted from ash-veneered MDF, with plans to roll out metal or glass-reinforced plastic Sleepboxes in the future. Measuring just 2.5×1.6m on its base and 3m high, the Sleepbox can be deployed in an airport “clean” zone, just in front of the gates, allowing for a quick rest before a flight. Airports would be able to charge a little extra for the convenience of having somewhere to rest your head, weary travellers will gladly use these impressive pods if they became available in the various airports and train stations around the world. Would be interesting to see how the pod would be cleaned, especially if people could rent it for hours at a time.